If a student leaves during a term then the fees for the whole term will apply. The above fee includes all school books, but does not include school trips, social events, IB Diploma Exam or MYP Record of Achievement fees for the MYP and DP students in their final year of MYP or DP. It will be assumed that full payment would be received at the beginning of the school year (after receipt of an invoice), but in exceptional cases we do accept payments per term (September, January, April) or monthly (10 monthly instalments, September-June). 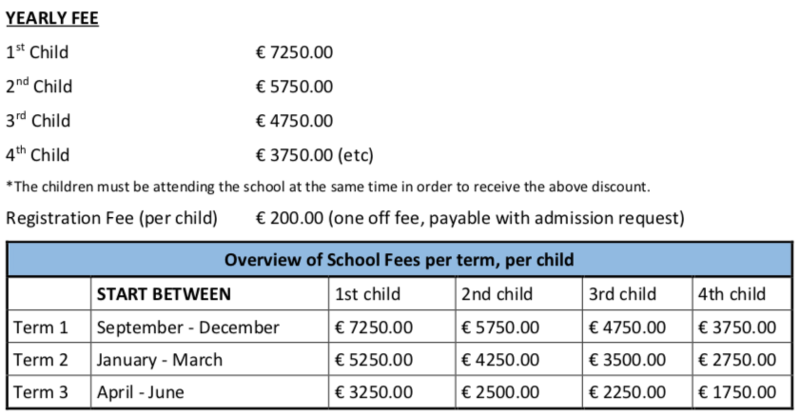 If you wish to take advantage of the flexible payment system then you will need to get in touch with the school secretary as soon as possible. The fee includes all required learning materials (books, etc). If the student loses or damages a book provided to them, then an invoice will be issued to you in order for us to replace it.